A friend from the National Stuttering Association and Stutter Social, David Resnick, recently gave a great TEDx Talk on using technology to build empathetic resonance. I’ll let him explain in his talk exactly what that is. I was thrilled to see another TED Talk where someone openly stutters and still communicates beautifully and effectively. Of course, my thrill was enhanced by the fact that I know David! And it was great to see Stutter Social featured and explained. I have been a Stutter Social host for two years now and I love it. The sense of community from a virtual stuttering support group certainly does build empathy. Enjoy David’s talk! It’s great! Finally, a person getting media attention who actually stutters! And she’s a SHE! Swedish golfer Sophie Gustafson did a media interview that got lots of attention from the stuttering community this week. This was a big deal for her, as she has shied away from most public speaking due to her stuttering. It is refreshing to see someone who has dealt with the physical, emotional and social aspects of stuttering actually talk about it, and stutter. She is not one of those who miraculously outgrew or overcame her stuttering. In this 2002 Sports Illustrated interview, she talks about how she has tried to manage her stuttering throughout her life, including therapy at the Hollins Institute. A couple of my friends suggested I try to contact Sophie and see if she would consider being a guest on the Women Who Stutter: Our Stories podcast. I contacted her through her Twitter account, and she actually responded. When I asked her if she would consider being a guest and sharing her story, she said she wasn’t ready for that. Those of us who stutter can certainly understand that! Today’s post is inspired by new friend Anna, who was featured in the January 2011 edition of the Toastmaster magazine. She was also a featured guest on “Women Who Stutter: Our Stories”, in Facing The Monster – Episode 44. Anna contributed some great comments on the most recent episode featuring Nina G – Standing Up. Anna notes the importance of “fluent stuttering”, which is a term described by Van Riper in the classic stuttering book, The Treatment of Stuttering. Someone once told me, “if it’s any consolation, at least your stuttering is easy to listen to”. I remember thinking, “why did she have to add the disclaimer phrase, if it’s any consolation?” To me, it sounded like she was paying me a compliment, but framing it as a negative, as if we are not ever supposed to say something positive about stuttering. Well, Anna de-bunks that and more! I want to share Anna’s recent comments about “fluent stuttering” and how it can be attained by focusing on “the outside” rather than “the inside”. I like to think of that as quieting our inner self-talk! Pam,thank you for yet another wonderful pod cast. Nina is another example (one is you) of a person who has something that I call “fluent stuttering”. This means speaking confidently and passionately, without avoidance and fear. The difference with this kind of stuttering from “typical stuttering” – that which can be monotone, deliberate, struggled, or covert speech (I had this too) – is that such fluid stuttering is easy to listen to. In a while you stop noticing the stuttering just as you stop noticing a bit of an accent or some other different speaking pattern. Speaking openly, expressively, without holding back is a very real goal. I myself aim for total fluency, but if I end up with fluent stuttering instead, I will be just as happy. By the way, I also learned a lot when I enrolled in a clown class – I am not performing on a real stage, but the whole approach to performing – learning how to interact with an audience and feeling confident on stage – is very valuable. One great thing I learned in clown school is about directing your attention outward. We have lots of exercises to make sure that we focus on the outside rather than staying inside our heads. We, people who stutter, are usually all inside our heads – watching ourselves, anticipating stuttering, trying to figure out listeners’ reaction etc. Having your attention concentrated on the outside allows you to enter the state of fluency and freedom of fear. The moment you go inside your head (I wonder how I am doing, do they like me? ), you get tense and nervous. Nina’s confidence on stage indicates that her attention is out there, she is connected to her audience. This is what makes Nina and others so fluent, despite stuttering. Fluent stuttering sounds strange, but it is a real phenomena and one that everyone can learn how to do. I just loved Anna’s thoughts and honesty, especially sharing that she took classes at Clown school. How exciting is that? What do you think of Fluent Stuttering? Can you see yourself doing that and being happy with it, as Anna suggests? Let us know your thoughts! As a person who stutters, I once believed no one would want to listen to me talk for any length of time. I had gotten “the look” too many times. You know the one I mean. When the listener first realizes something is different, and the look of surprise appears. Their eyebrows arch, eyes widen, and then they quickly glance away. Then, maybe thinking that to be rude, they look back for a second, and quickly break eye contact again. Then they look distracted, looking at their watch, or a clock, or suddenly seem fascinated with the cracks in the ceiling tiles. They look everywhere but at me, the person talking and stuttering. Amazing how this can be read in seconds. This week, I am pushing outside of my comfort zone in a new way. I have been a member of the Inter-Faith Story Circle of the Tri-City Area for just less than a year. I will facilitate the December circle and talk about my stuttering journey, to people who don’t stutter. Some of them may have never heard a real stutterer stutter. I have a theme, “Stories of Trust, Leaps of Faith and Courage”. I plan to open with a reflection and tell three stories. Then, circle members will be invited to share a story of their own, if they wish. It becomes a story swap. We do not process, offer feedback or applaud. We just listen and let the stories in. As a gesture of acknowledgment, members gently rub our hands together after a story is told. In preparation for the circle, one of the seasoned tellers offered to “listen out my stories”. We met last week in a coffee shop, and over tea, I told my stories and she listened, really listened. She had a notepad with her and shared that she might jot some thoughts for feedback after. I was a little worried about that. But I didn’t need to be. She was a seasoned listener. As I told, I “watched her listen”. She never took her eyes away from me. She was entirely present. Her facial expressions matched my tone. She took notes without ever looking down at her pad. Her eyes showed emotion, sometimes a smile, or look of surprise, or sadness, or wonder. Mostly presence though. I stopped “watching her listen”, and just relaxed and told. I did not gaze directly at her, as suddenly I felt so free that someone was listening with intent, that I found more passion in my voice, used more imagery to describe a memory and used my hands to gesture. When I glanced at this woman, she was totally with me, listening, feeling the emotion of my story. As I neared the end, I felt overwhelmed with what I had shared to a near stranger. I choked up and my eyes brimmed over. I looked down for a second and back up. Her eyes were also watery and it was OK. 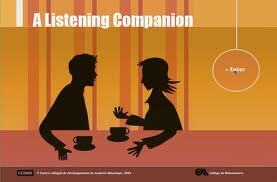 I had never had someone listen so intently, even as I openly stuttered. We paused and smiled at each other and then she said she wanted to share with me what she had heard. She offered me “appreciations” – told me all the things that had moved her and that helped create images in her mind as she listened. I had expected to get “feedback” such as things I should change in my stories. Nope. This woman who I did not know very well just listened, appreciated, and told me that. What an intimate experience to have had. I felt that what we had done had mattered a great deal that evening in the little coffee shop. I felt valued and alive. When we said good night and hugged, my eyes welled up again. We weren’t strangers anymore.